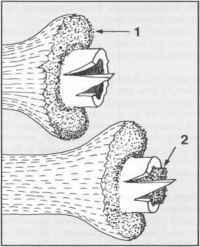 Type I: The whole epiphysis is separated from the shaft. Type 2: The epiphysis is displaced, carrying with it a small, triangular metaphyseal fragment (the commonest injury). Type 3: Separation of part of the epiphysis. Type 4: Separation of part of the epiphysis, with a metaphyseal fragment. 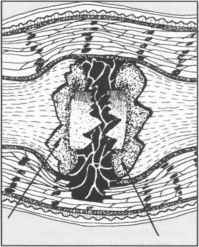 Type 5: Crashing of part or all of the epiphysis. 78. 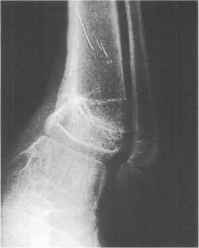 Type 1 injuries (a): The epiphysis is separated from the shall without any accompanying fracture. "I'llis may follow trauma in childhood (illustrated is a traumatic displacement of the distal femoral epiphysis) or result from a birth injury. It may occur secondary to a joint infection, rickets or scurvy. Reduction by manipulation is usually easy in traumatic lesions, and the prognosis is g<xxl unless the epiphysis lies wholly within the joint. 79. Type 1 injuries (b): An endocrine disturbance is thought to be an important factor in the common forms of slipped upper femoral epiphysis. Avascular necrosis is not uncommon, especially if forcible reduction is attempted after a delay in diagnosis. Growth arrest is seldom a problem (as it occurs in adolescence towards the end of growth, and as most femoral growth is at the distal end). 80. 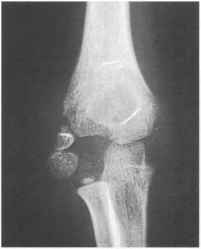 Type 2 injuries: The epiphysis displaces, carrying with it a small triangular fragment of the metaphysis (illustrated here in the distal femur). It is caused by trauma and is the commonest of epiphyseal injuries. Its highest incidence is in early adolescence. Growth disturbance is relatively uncommon. Reduction must be early - it becomes difficult after 48 hours by closed methods. 81. Type 3 injuries: Part of the epiphysis is separated. Accurate reduction is necessary in this type of injury to restore the smoothness and regularity of the articular surface. The prognosis is generally good unless the severity of the initial displacement has disrupted the blood supply to the fragment. The lower and upper tibial epiphyses are most commonly affected (note separated portion of tibial epiphysis behind lateral malleolus). 82. Type 4 injuries: Separation of part of the epiphysis with a metaphyseal fragment. The lateral condyle of the humerus is most commonly affected and must be accurately reduced open reduction is usually necessary. 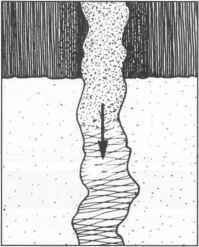 Failure of reduction leads to bone formation in the gap and marked disturbance of growth. 83. Type 5 injuries: Crushing or other damage to the epiphyseal plate. 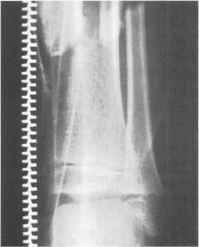 This radiograph of a child who was dragged along the road by a car shows the medial malleolus, part of the epiphyseal plate and the adjacent tibia have been removed by abrasion (the tibia is also fractured). 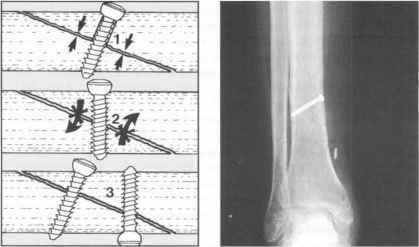 The epiphyseal plate may also he crushed in severe abduction and adduction injuries of the ankle. 84. Growth disturbances (a): If growth is arrested over part of the epiphyseal plate only, there will he progressive angulatory deformity alTecting the axis of movement of the related joint, lite re will he a little overall shortening. 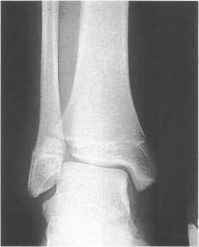 This radiograph shows the tilting of the plane of the ankle joint whieh occurred in the last case, with deformity of the fool and ankle. In the clhow, injuries of this type may lead to cubitus varus or valgus. 85. Growth disturbances (b): If the whole epiphyseal plate is affected, growth will be arrested, leading to greater shortening of the bone. The linal result will depend on the age at which epiphyseal arrest occurred, and the epiphysis involved; obviously the younger the child, the greater is the growih loss. Arrest of one epiphysis in paired bones will lead to joint deformity. In the case illustrated, the radial epiphysis on the right has suffered complete growth arrest following a displaced lower radial epiphysis. The ulna has continued to grow at its usual rate; its distal end appears prominent on Ihe dorsum of the wrist, and I here is obvious deformity and impairment of function in the wrist. The normal left side is shown for comparison. 86. 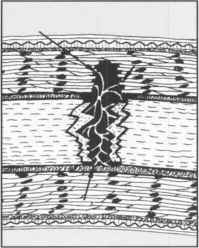 Fracture healing: As a result of (he injury. (I) the periosteum may be completely or partly torn. (2) there is disruption of the Haversian systems with death of adjacent bone cells, (3) there may be tearing of muscle, especially on the convex side of the fracture, and damage to neighbouring nerves and blood vessels, and (4) the skin may be broached in compound injuries, with risk of ingress of bacteria. 88. Fracture haematoma (b): The fracture haematoma is rapidly vasculariscd by the ingrowth of blood vessels from the surrounding tissues, and for some weeks there is rapid cellular activity. Hbrovascular tissue replaces the clot, collagen libres are laid down and mineral salts are deposited. 90. Primary callus response: TTiis remains active for a Jew weeks only (I). There is a much less vigorous formation of callus from the medullary cavity (2). Nevertheless, the capacity of the medulla to form new bone remains indefinitely throughout the healing of the fracture. 91. Bridging external callus (a): If the periosteum is incompletely torn, and there is no significant loss of bony apposition, the primary callus response may result in establishing external continuity of the fracture ('bridging external callus'). 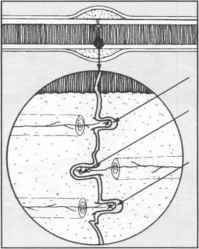 Cells lying in the outer layer of (he periosteum itself proliferate to reconstitute the periosteum. 92. 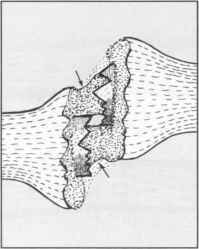 Bridging external callus (b): II the pap is more substantial, fibrous tissue formed from the organisation of the fracture hacmatoma will lie between the advancing collars of subperiosteal new bone. This fibrous tissue may be stimulated to form bone l 'tissue induction'), again resulting in bridging callus. 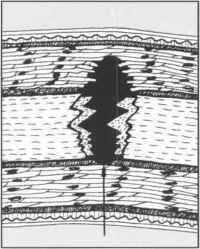 The mechanism may be due to a change of electrical potential at the fracture site or to a (hypothetical) wound hormone. 93. Bridging external callus (c): If the bone ends are offset, the primary callus from the subperiosteal region may unite with medullary callus. The net result of the three mechanisms just described is that the fracture becomes rigid, function in the limb returns and the situation is rendered favourable for endosteal bone formation and remodelling. 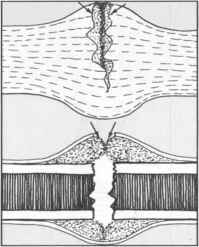 (a): If there is no gap between (he bone ends, osteoclasts can tunnel across the fracture line in advance of ingrowing blood vessels and osteoblasts, which form new Haversian systems. Dead bone is rcvasculariscd and may provide an invaluable scaffolding and local mineral source. This process cannot occur if the fracture is mobile. (b): The formation of new cortical bone, with re-establishment of continuity between the Haversian systems on either side, cannot occur if fibrous tissue remains occupying the space between the bone ends. If this is present, it must be removed and replaced with woven bone. This is generally achieved by ingrowth of medullary callus which remains active through the healing phase. 96. Endosteal new bone formation (c): Where the bone ends are supported by rigid internal fixation, there is no functional requirement for external bridging callus: as a result external bridging callus may not be seen, or be minimal. Healing of the fracture occurs slowly through the formation of new cortical bone between the bone ends. 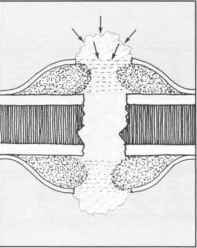 Il is therefore essential that internal fixation devices arc retained until this process is complete. Remodelling: After clinical union, new Haversian systems are laid down along the lines of stress. In areas free from stress, bone is removed by osteoclasts, liventually little trace of external bridging callus will remain. The power to remodel bone in this way is great in children, hut not so marked in ihc adult. In a child, most or all traccs of fracture displacement (including even off-ending) will disappear. There is also some power to correct angulation, although this becomes progressively less as the child approaches adolescence. Any axial rotation, however, is likely to remain. In the adult, there is virtually no correction of axial rotation or angulation. It is. therefore, important that axial rotation deformity is always corrected, and that angulation, particularly in adults, should not be accepted. Bone morphogenic proteins (BMP): These make up a family of proteins which have osteogenic facility. At least 14 (BMI* 2—15) have been identified: they have been purified, cloned and sequenced into human recombinant forms. They function by inducing mesenchymal cells to transform - first into cartilage and then into bone cells. They may produce and mineralise osteoid, influence angiogenesis. and play a part in bone remodelling. They may also have a role to play in articular cartilage repair. BMP are being evaluated for effectiveness and safety in die treatment of non-unions, bone segmental defects and avascular necrosis, especially of the femoral head. What is epiphyseal metaphyseal injuries? What methods to treat epiphyseal fracture? What is an epipheseal fragment? What are epiphyseal plate injuries?